The City of Bath, in Roman times known as Aquae Sulis, was added because of the exceptional value of the historic and monumental ensemble of its city. The development of Bath as spa town was made possible by the continuous flow of hot mineral water from the ground. The water temperature is 46 (C), and it contains 43 kinds of minerals. It can be tasted in the elegant Pump Room. Arriving from Cardiff by train, Bath presents itself as a clean, quiet and green city. The railway station even is called Bath Spa, a double hint to the town's claim to fame. The Roman Baths lie in the city center, amidst the 21st century shops and restaurants. The baths are now 6 meters below street level: amazing to think how many building generations have passed to add so many new layers of bricks. Descending to the ground floor where the actual baths are, you pass the elegant Pump Room. This has been the place to taste water from the spa for ages (I didn't). Further down, the museum proudly displays its topclass exhibits, as the almost intact bronze head of Minerva. Finally arriving at the baths you can sit and relax, imagening yourself to be a real Roman. March 2018 - We had another night in our camper, this time in Exmoor NP. In the morning we wanted to have some Cheddar and went straight through the Name giving Gorge. Unfortunaley beside some tourist traps, there wasnt much for cheese lovers. We arrived in Bath around 10 am. The city was already crowded with touristst and visiting school classes. We found a parking lot just at the Circus and walked for about two hous throught the Victorian city landscape. We also visited the roman bath but didnt enter. Lots of money for a reconstruction?! Interesting was also the bridge, when standing on it you dont even have the impression you are on a bridge. A little bit like Ponte Vecchio in Florence with all these shops. The city is very intact and planned well. Nice to visit and take a step back in history. We enjoyed it very much and it was very realxing before we eventually went to Bristol. Visited October 2016. 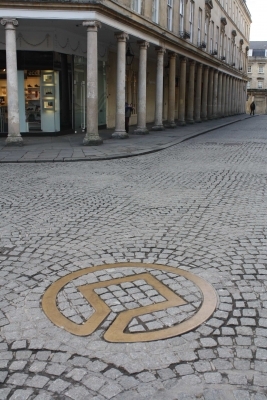 You can visit the city of Bath as a day trip from Bristol or even London. The train station Bath Spa is located just few hundred meters from the main attractions of the city. 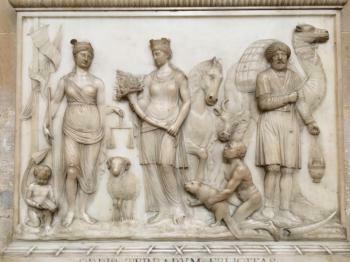 Of course the most important monument is the museum located at the sites of ancient Roman baths. I can hardly imagine visiting these baths during summer weekends: even in October the place was so crowded and the line for the tickets so long – it took us almost one hour to get in! But when you’re inside, just enjoy the underground labyrinth of alleys. They have audio guides in many languages. After visiting the museum it is good to have a cup of tea in the Pump Room. The medieval part of Bath is the Abbey Church of Saint Peter and Saint Paul, commonly known as Bath Abbey. Don’t miss the the sculptures of angels climb Jacob's Ladder on the west front and some very interesting memorials; one of them belonging to Sir William Baker, director of the East India Company (camel) and the governor of Hudson’s Bay Company (beaver). The city is full of Georgian architecture: Royal Crescent, Circus, Gay Street, Pulteney Bridge. The City of Bath – my nearest WHS – is really two significant cities, one on top of the other (perhaps a bit like Aquileia). It have been there several times, including in May 2014 and July 2015. Bath is notable as both a Roman town “amongst the most famous and important Roman remains north of the Alps” and as a triumph of Georgian town planning. Among the artifacts discovered in Bath is a fierce-looking carving that stood over the entrance. Archaeologists don’t agree on whom it is meant to depict – with snakes for hair it resembles a gorgon, except for the fact that gorgons were always female, and this face is clearly a man’s. In addition to the bathhouse, Bath is famed for its consistent and extensive Georgian architectural style. This was the pet project of three 18th century architects under George III who set out to create in England one of the most beautiful cities in Europe. We crossed the river Avon, where a boat appeared to have taken a wrong turning, and walked up the impressive Great Pulteney Street toward Sydney Gardens. I returned Bath the following summer. This time we went inside the preserved house, Number 1 Royal Crescent. It is a well-kept Georgian house with three stories and a prime position on the crescent, giving it an enviable view. I visited Bath on a short day trip in June 2013. It definitely deserves at least a long weekend but hopefully I'll visit again sometime. The Roman Baths and Pump Room are in very good condition and the audio guide or live guide tours are very informative and not at all boring. The sheer size of the baths is mindboggling. Pulteney Bridge is no Ponte Vecchio but still I enjoyed a quick stroll round the nearby gardens. All the buildings are very well kept and did not suffer any major damage during the Wars. The Royal Crescent and Circus are a work of art and worth a visit too. The locals are really friendly and very welcoming, so I next time I'll allow a longer visit to enjoy all the sights at a slower pace. i was born and raised in bath but now live in virginia USA. although i love it here i struggle for my fix of beautiful architecture and bath has that in abundance. i miss the great pubs and gardens around the city and the theatre. it truly is a place to visit when in the country and the bus tours give a great commentary whilst showing Bath in all its glory. I visited the city of Bath during my visit to England last June. I liked the city very much and a tour of the Roman baths with audio guide was a wonderful experience. The visit to Jane Austen Centre was unexpected but so very delightful, esp having read her novels as a student of English literature. I made the same experience as Josh from the USA. 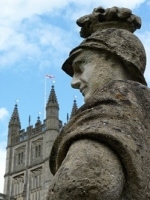 I attented an English Language Course in Bath and found the City very stunning. Because I lived in a house of London Road, I had to bear heavy traffic every day on my way to school, so I decided to take some pictures of the traffic, especially of the buses in the City Center: a small documentation of one of the main sources of air pollution in Bath. I found that Bath itself is quite a visually stunning city.It's large cathedral is somewhat stunning,particually so at the night time.I believe that it is best experienced at winter time.The only disappointment i found with bath is the ever-growing pollution and the large ammount of rubbish and litter.Even though, Bath is a nice place to live and visit with many things to do. The city of bath is amazing. I went im May of 2006 with my middle school. It was an amazing expierence. Now that I am studying that in history, I am so glad to be able to say that I was actually there. I am a Bathonian, having being born and raised in the City, I currently live in NYC USa and have traveled the world, to dat eBath is still one of the most beutiful cities I have been to, I strongly advise a visit there if you have time, the night life is great for such a small city, famous for it's music and culture in the south west. I have to say that I was somewhat disappointed by Bath. The Roman Baths are very impressive, very well preserved, and definitely worth a visit despite the price, but the rest of the city was a bit of a let-down. The cathedral is nice, but not really special, and the 18th-century buildings like the Royal Crescent are small and somehow inconspicuous. Go to Bath if you are in the area, but it's not really a must-see sight. Actually I liked nearby Bristol much more - a lively city with plenty to see and do. I have visited Bath on several occasions now and it is a really lovely city to visit, quintessentially English, but famous for its Roman roots. The whole city is made of local sandstone and it looks very impressive, especially if you manage to visit on a sunny day when the warm creamy stone seems to glow and liven up the whole centre. The interior of the Abbey is well worth a look as it has some impressive fan vaulting. Perhaps one of the most impressive features and the most famous are the Roman baths, and I would strongly recommend paying the high entrance fee to see them, they really add to the whole experience and there is a lot more to see than just the central pool, the remains of the roman temple, which lie underneath the main square are particularly impressive. 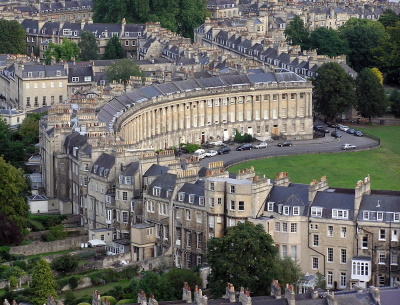 Much of Bath's lay out and current architectural features are from the Neo-Classical Georgian period, which had a huge impact on the design of a huge number towns in Britain as well as further abroad (Edinburgh and Monticello/ University of Virginia are other WH sites where you can see this). Two of the most impressive examples of this style are the Circus and the Crescent which are a little further up through the town, providing a nice walk. Bath is very easy to get to, it is on the main train-line from London to Wales easy to get to from the south as well, if you have a car it is just off of the M4 which runs from London, (just off of this road is Avebury which is part of the Stonehenge World Heritage site as well near Swindon). 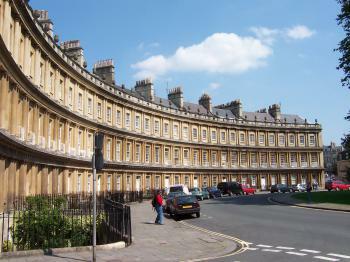 Bath is a nice day trip from London, and is impressive due to its uniformity. Bath is a splendid city. I went there on a holiday and I spent some nice time walking through the Roman past. Its also very small. You can take a paid bus tour or a free walking tour with a guide and you walk through the city in only 2 hours. The most beautiful view of the city is the sunlight shining into the ruin of Roman Bath and the building of Crescent. I spent 6 months in 2003 at City of Bath as a Socrates-Erasmus student. This wonderful city created an lovely impression at me. Its clean green parks, street entertainers, helpful people and Abbey Churchyard are forever written in my mind. Daily Bath is quite busy and full of tourists but City Centre at night is such a silent, amazingly lit and romantic place! It is worth visiting for everyone! Railways: Railway elements within the City Centre, among which: Bath Spa Railway station (built in 1840). An interesting aside is the fact that this site and others in Bath are ALSO included within the UK T List site of "Great Western Railway Paddington to Bristol Selected parts"
Damaged in World War II: "Bath suffered three air raids in reprisal for RAF raids on the German cities of L?beck and Rostock, part of the Luftwaffe campaign popularly known as the Baedeker Blitz. Over 400 people were killed, and more than 19,000 buildings were damaged or destroyed. Houses in the Royal Crescent, Circus and Paragon were burnt out along with the Assembly Rooms, while the south side of Queen Square was destroyed. All have since been reconstructed, and regeneration work is continuing." Scientific Developments: In 1781 William Herschel discovered the planet Uranus (orginally named "The Georgian Star" after the king! )using a home made telescope operated from the garden of his house in New King St (Now the Herschel Museum of Astronomy). It was the first planet to be discovered which could not be seen by the naked eye.